The internet has given anyone with a connection access to the largest publishing platform ever known. This means that artists, musicians, authors, journalists, and business people have direct access to their fans, audience, and customers. But this also means that it is much harder to get anyone’s attention: if everyone is self-publishing on the internet, how do you stand out? You have to get into the content game. Content Marketing is relevant, valuable content you create to educate, inform, and inspire your audience, fans, or customers. It isn’t sales OR advertising: but it can be much cheaper, and much more effective. And you can do it yourself if you keep the simple TNT formula in mind: Trust, Niche, and Teach. Brands like Red Bull, Chipotle, and Marriot are bypassing the media and traditional ad agencies and creating their own channels and content that looks nothing like an ad. The content is authentic, targeted, and educates, informs, and entertains. They are using content to develop a relationship of trust with their customers. 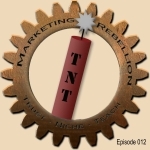 The Marketing Rebellion podcast explores these ideas; we review the gadgets and devices you can use to produce your own content, and look at some of the ways you can figure out what is best for your brand (Trust), who your target users are (Niche) and what content will best deliver value to them (Teach).